Look for the fury claws and a notch between the eyes with four spines on each side of the notch. To track the current distribution and status of the Chinese Mitten Crab (Eriocheir sinensis) in the U.S. Mid-Atlantic and beyond, including all coasts of North America. A Chinese Mitten Crab showing its key identifying features - furry claws, a central notch, and four spines located on the each side of the carapace. The Chinese Mitten Crab (Eriocheir sinensis) is native to East Asia and is considered an established invader in Europe and the United States. The first established US population was in California’s San Francisco Bay and Delta in the 1980s. Between 1998 and 2000, catches reached 100,000 - 800,000 crabs per year in some parts of San Francisco Bay but has gone undetected since 2010. The first confirmed record of Chinese Mitten Crabs in the Mid-Atlantic was from Baltimore, Maryland in 2005. Between 2005 and 2014 crabs were reported in the US Mid-Atlantic from Maryland to Connecticut. Mitten crabs have also been found sporadically in the Great Lakes and the US Gulf Coast, but haven’t established a breeding population in either region. 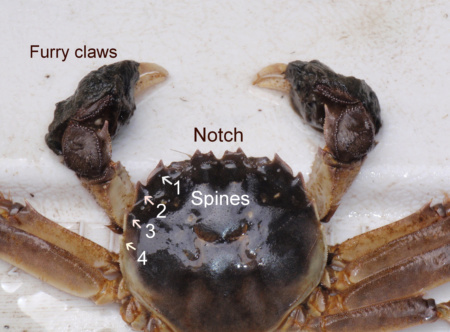 Spurred by the initial Chesapeake Bay report in 2005, we launched an online tracking system called Mitten Crab Watch (https://mittencrab.nisbase.org/) and hotline (443-482-2222), and received new reports of Chinese Mitten Crabs throughout the U.S. Mid-Atlantic region, especially from Maryland to New York. In the early years of Mitten Crab Watch, we confirmed over 150 reports from commercial and recreational fisherman along the eastern U.S., with most from the Hudson River in New York. These public-sourced reports confirmed the first Chinese Mitten Crabs breeding population for the eastern U.S., but the last record of a live crab for the region is from Chesapeake Bay in 2014. Similarly, no crabs have been reported in California since 2010. The absence of recent records on the East and West Coasts is puzzling. Are the crabs now gone from the U.S. east or west coast? Or, are they just in low abundance and hard to detect? We need your help to solve this mystery! Please report a mitten crab by submitting information and photos at https://mittencrab.nisbase.org/ or sending an email to SERCMittenCrab@si.edu. We will reply to each report and may also ask about any specimens that you may have collected. For other questions, you can also contact the Mitten Crab Hotline at 443-482-2222.